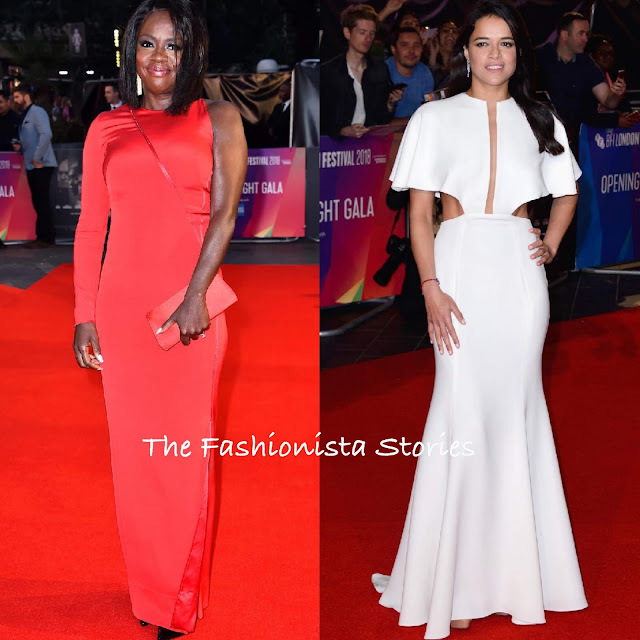 Braving the wind, Viola Davis and Michelle Rodriguez posed on the red carpet for the 'Widows' premiere and opening night gala of the 62nd BFI London Film Festival at the Embankment Garden Cinema yesterday(October 10th) in London. Viola Davis is known for serving up bold solid hue colors on the red carpet. However I don't think this AKRIS red one long sleeve, side split dress had as much impact as her usual looks. Maybe she should have gone with a statement heel over the basic black pumps or wore statement accessories. She looks pretty but this isn't memorable. A TYLER ELLIS clutch finished up her look. Michelle Rodriguez opted for a sultry JULIANNA BASS FALL 2018 white cutout, cape sleeve dress. In the look book, the dress was shown in a black textured version but I prefer the white on Michelle. Her look was accessorized with APM MONACO jewelry and CHRISTIAN LOUBOUTIN heels.